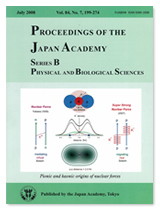 The most basic form of the K-mesonic nuclear system, K-pp, reveals a molecular structure, surprisingly similar to H2+ though the energy scale is 100 MeV and the length scale is 1-2 fm, as shown by Yamazaki and Akaishi in a previous paper (Proc. Jpn. Acad. B 83, 144-150, 2007). The strong attraction between K- and p causes migration of a K- between the two protons, producing a strong binding of K-pp through the large exchange integral. A new mechanism for a super-strong nuclear force by migrating “real” K- mesons (shown in the right diagram), in contrast to the ordinary nuclear force mediated by “virtual” Yukawa mesons (well established since 1935, the left diagram), is proposed. This can be viewed as a revival of the Heitler-London mechanism applied to nuclear force by Heisenberg in 1932. 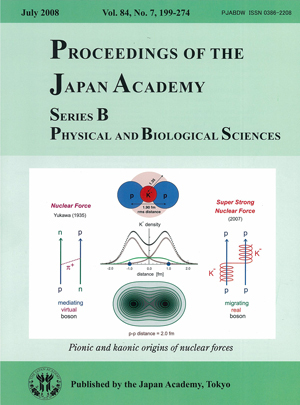 The paper by Akaishi, Myint and Yamazaki in this issue, “Kaonic Nuclear Systems Kbar N and Kbar NN as Decaying States”, follows this subject and illuminates the controversial issue of the decay width.